Cargolux Airlines, Europe’s largest all-cargo carrier, has included Bahrain International Airport (BIA) in its network of operations. The company has also signed a letter of intent (LoI) with Oman Air to enable it to use the latter’s facilities at three Omani airports. Cargolux’s first Bahrain landing was celebrated at a ceremony attended by Bahrain Airport Company and Cargolux officials. Cargolux takes the number of BIA’s cargo airlines to 15, said a statement. Cargolux will transport to Bahrain items including spare parts, machinery, food and consumer goods that include textiles from the US and European markets. “Cargolux is a significant addition to our expanding airline portfolio which we will continue to grow in line with future aviation trends and demands,” he added. Cargolux boasts a worldwide network covering up to 90 destinations, some of which are served on scheduled all-cargo flights. The company has more than 85 offices in over 50 countries, and offers an extensive global trucking network to more than 250 destinations as well as charter and aircraft maintenance services. The airline operates a modern fleet of 22 aircraft consisting of 11 Boeing 747-8F and 11 747-400F. The LOI with Oman Air will enable the freight specialist to use Oman Air’s facilities in Muscat, Salalah and Sohar. The agreement includes the launch on April 15 of Cargolux’s full freighter services from Luxembourg to India via Oman, said a statement. The formal signing of the agreement will take place when the first Cargolux flight arrives in Muscat on April 16, it said. The agreement signifies Oman Air’s latest step in expanding its cargo operations. It follows earlier initiatives by the national carrier of Oman, including the launch of pan-GCC and pan-European trucking services, and a joint cargo service with DHL between Oman and Dubai. Cargolux intends to increase the number of services it operates to Oman during this year to several flights per week, with onward connections to multiple Indian cities, including Chennai, Bombay and Hyderabad. Additional services to cities in India are being considered and connections to China, Europe, Africa and the United States are also planned. In addition, Oman Air will provide Cargolux with access to the freight capacity of its passenger fleet, which flies to 11 destinations in India and three in Pakistan, as well as to destinations in Nepal, Bangladesh and Sri Lanka. This will give the Luxembourg–based carrier the opportunity to feed consolidated freight to Oman from a number of larger markets. Paul Gregorowitsch, chief executive officer of Oman Air, said: “Oman Air has an extensive and long-term experience of operating flights to numerous destinations across the Indian sub-continent and East Africa. 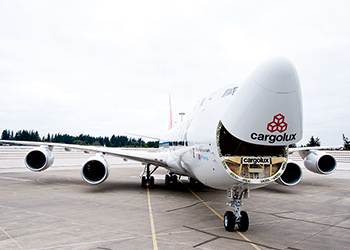 “Cargolux is a leader in carrying air freight and offers huge capacity. This agreement therefore represents an important strategic partnership that will give an important boost to the Sultanate of Oman’s standing as a major hub for the movement of freight between Europe, Asia and Africa.